The Gingerbread update for the Motorola DROID X has been live for about a week now, but the improvements that it brings seem to be anything but solely superficial. According to the feedback that we just got from a fellow tipster, the phone now shows a significant boost in performance in comparison to the time when it was running an older Android version. The numbers simply speak for themselves. 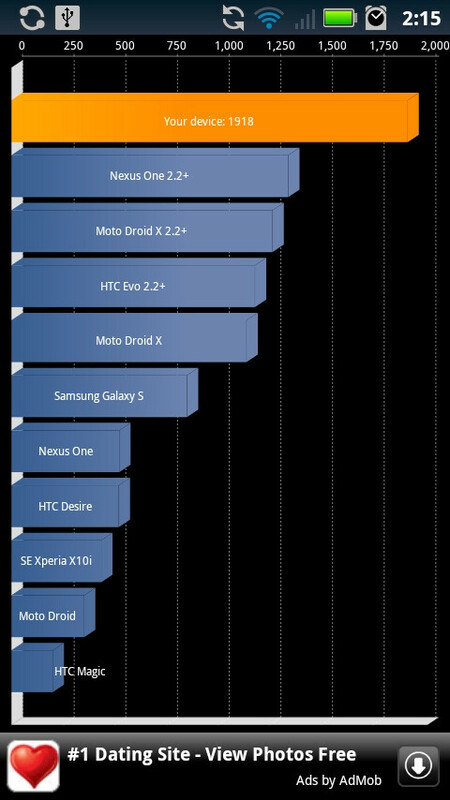 As you can see in the screenshot below, the DROID X scored up to 1918 points on Quadrant and further benchmarks reportedly kept delivering results above the 1800 mark. Such milestones would have been pretty much unreachable prior to the Gingerbread update, when the handset was getting a bit over 1000. Anybody who thinks their DROID X can beat this? Comments and tips from you, dear readers, are more than welcome! My DX got 1903 on Quadrant from the first try. I like Gb a lot but it drains my battery so fast. I have the lateset leaked version. Checked my wife's X two nights ago and nothing yet. The people running Gingerbread, myself included, are running a pre-release leak. You can manually check until the cows come home but you won't see anything until Motorola/Verizon officially launch it. Grab a copy of the leak and dive in. Reverting back to 2.2 is easy so you won't have any issues getting the official Gingerbread goodness when it comes out. Actually it has been released officially. My boss received his update yesterday OTA while at work, and he loves it. No leak involved. Been checking my droid x and still have 2.2.1. I called Verizon support and the girl didn't know anything about gingerbread update. What's up with that? It might have been a limited test release by Motorola. I had to download mine manually (there's multiple mirrors listed on the various forums now). Seems the best route is to download the update on your computer, mount your phone and throw it into the "sdcard" folder. No subdirectories, just "sdcard." Then here are the instructions: 1. Rename the file "update.zip" 2. Shut off your phone. 3. Reboot into recovery; this is done by holding down the home button and THEN pressing and holding the power button. 4. Once the Droid guy with the triangle appears, hit the search button. 5. Use the volume buttons to navigate, then the camera shutter button to select "update from sdcard" or whatever it says (can't remember the exact wording, but you'll know it, there's only four options available anyway) 6. Let the update roll; if you placed the file in the right folder (SDCARD, NO SUBDIRECTORIES) and renamed it properly, it should go through automatically. It takes about four minutes to completely install. 7. Once the update is done, select "reboot" and let it reboot. If the update worked, the initial Moto logo should be white on red instead of black on white. The first boot will also take several minutes, but any subsequent boot I've done takes only seconds. 8. Oh, and by the way, make sure you have a decent amount of juice left in the battery before you do this. Plug the phone in if necessary while you're running the update. Or charge a while before. the power of android at its finest! Nice to see that someone didn't like this article at all, and had to indiscriminately downthumb everyone. What's not to like about Gingerbread on the Droid X boosting its performance? http://www.gottabemobile.com/2011/04/12/motorola-droid-x-gingerbread-update-leaks-get-it-now/ Try this link, clicking on the shortcut in the article popped up a direct download window. Does your X have to be rooted to get this Gingerbread update manually? No it does not, not at all. If you follow the instructions I posted earlier here, you should be fine. Heck, even if you screw up any of the prior steps (I did, I was following a less concise version of the instructions and had to figure out the little things I was doing wrong) it just fails to update, no harm done to your phone. I think about the only thing you can do to truly screw up your phone while trying the update is to let the phone die or yank the battery while it's installing, in which case you can still factory restore the device. Excellent question though, sorry I didn't think to address it before. After trying many different ways of installing it keeps failing.. I have followed the instructions exactly how you put out there. this is what I keep getting: E: Can't open / cashe/recovery/command -- Install from sdcard... ...Finding update package... Opening update package... Verifying update package... E: failed to open /sdcard/update.zip (No such file or directory) E:signature verification failed Installation aborted. Not sure what I am doing wrong at this point. Sounds like you have it named wrong and/or in the wrong place. If you already renamed it "update.zip" try renaming it as "update". The file also literally needs to be in the /sdcard folder, not in downloads or anywhere else. In other words, it's like saving something to C drive on your computer instead of Documents. I installed the update without any problems. What I'm wondering is when the final version is released OTA, will it install automatically or will I have to remove the pre-release update? If I have to revert back to 2.2, how do I do this? Reports are that this may be the final cut of the release, just not rolled out to everyone yet. If this is not the final version (though I can't imagine what more the release needs) you may have to revert to 2.2, but I don't know how to do this. I know you can factory reset to 2.1. Why do you need to revert to 2.2?